W. L Gore & Associates (Gore) presents GORE® Microwave/RF Assemblies, Type 5H optimized specifically for Ka-Band uplink and downlink aerospace applications. The durable construction of GORE® Microwave/RF Assemblies, Type 5H provides outstanding shielding effectiveness to ensure reliable signal integrity with excellent insertion loss and return loss for reduced life-cycle costs. W. L Gore & Associates (Gore) presents GORE® Microwave/RF Assemblies, Type 5H optimized specifically for Ka-Band uplink and downlink aerospace applications. These cables deliver superior radio frequency performance up to 32 GHz and meet the stringent specification requirements of current and future generation aircraft. The durable construction of GORE® Microwave/RF Assemblies, Type 5H provides outstanding shielding effectiveness to ensure reliable signal integrity with excellent insertion loss and return loss for reduced life-cycle costs. In addition, Type 5H have robust connector solutions designed to withstand challenging aerospace environments such as vibration during launch without compromising signal integrity. 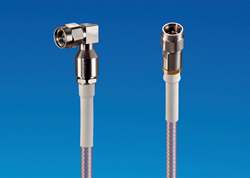 These low-profile connectors also increase flexibility during the initial design process. GORE® Microwave/RF Assemblies, Type 5H for Ka-Band applications will be on display at the Aircraft Interiors Expo in Hamburg, Germany on April 5-7, Booth 3C20. For more information, visit gore.com/electronics, or contact a Gore applications specialist at electronics.usa(at)wlgore.com. Gore is a technology-driven company focused on discovery and product innovation. Well known for waterproof, breathable GORE-TEX® fabric, the company’s portfolio includes everything from high-performance fabrics and implantable medical devices to industrial manufacturing components and aerospace electronics. Founded in 1958 and headquartered in Newark, Del., Gore posts annual sales of more than $3.2 billion and employs approximately 10,000 associates with manufacturing facilities in the United States, Germany, the United Kingdom, Japan and China, and sales offices around the world. Gore is one of a select few companies to appear on all of the U.S. “100 Best Companies to Work For” lists since the rankings debuted in 1984. The company also appears regularly on similar lists around the world. Learn more at gore.com. GORE, GORE-TEX, and design are trademarks of W. L. Gore & Associates.